Is there any justification in the original Greek text for translating θεὸς into English as “a god”? Long answer: While the Greek lacks the definite article on theos in the clause under discussion, that doesn't mean the English should be translated with an indefinite article. Greek and English do not enjoy a one-to-one relationship between their words. There are times in Greek when the article is present but not translated into English. Likewise, there are places where the article is not present in the Greek but the English requires it, or in this case, requires something to show the definiteness of the word. Example 1: John 18:16 in Greek literally says: "...the disciple, the other, the one known to the high priest..." That's horrible English. So it gets translated (rightly) as "the other disciple, who was known to the high priest." As you can see the word order changed coming into English as well as two definite articles dropping out. 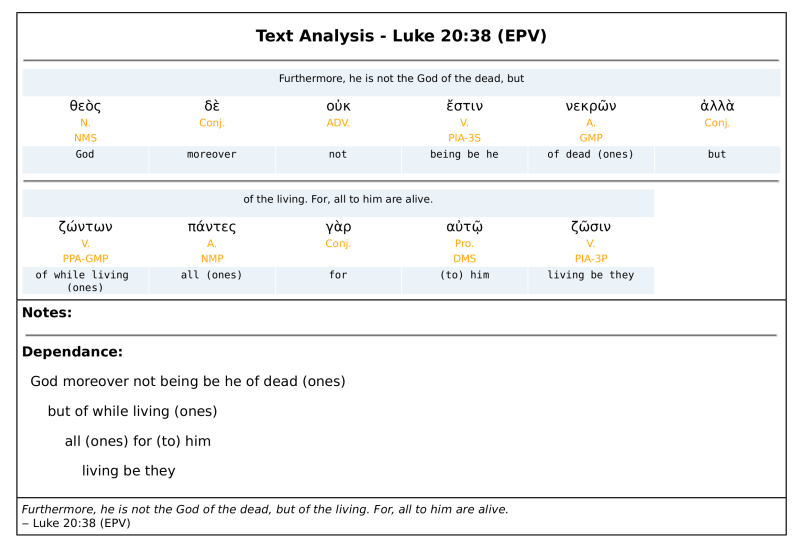 Example 2: John 1:1 contains another example of a time without an article in Greek but needed in English. It says, "en arche 'en o logos..." that is (literally) "In beginning was the Word." Notice that there is no definite article before arche. However, even the New World Translation puts the article there. That is how it should be. To leave it out would cause confusion in the English "In a beginning was the Word..." That implies that there were multiple beginnings to the universe, but that isn't what the Bible teaches. It's a difference in Greek and English. Likewise, the Septuagint of Genesis starts with en arche. The reason the clause at the end of John 1:1 lacks the article deals with rules of Greek grammar. English uses word order to drive the meaning of a sentence. We almost always have subjects first, then verbs, then the objects (excepted Yoda speech is). Greek doesn't use word order to differentiate between types of nouns. They use word order for emphasis (Hebrew does the same thing). To tell the difference in the subject and the object (both of which are nouns), Greek uses case endings. They can then put the object of the verb at the beginning of the clause with the subject after the verb and still know what the sentence means. In English, "dog bites man" and "man bites dog" mean entirely different things. However, in Greek, they would put case endings on the nouns and comprehend the same meaning even with the word order switched around. In the following example, I am using case endings here as an illustration. [s] means subject, and [o] means object. In Greek there is no difference between "dog[s] bites man[o]" and "man[o] bites dog[s]." They mean the exact same thing. This works with action verbs, linking verbs are different, but the action verbs show how the Greek usually works. The clause in question (which uses a linking verb) literally reads kai theos 'en 'o logos (literally "and God was the Word" but you won't find it translated that way for good reason). Notice that the word order is switched around with "God" at the front of the clause. Because the verb is a linking verb, the subject and object use the same case ending, the nominative. With a linking verb, the part of the clause that would be the object often drops the article (even though it would use it otherwise), especially when it is in front of the verb (as here). When the object of a clause is a noun like this, it is called the "predicate nominative" and Colwell's Rule allows the translation to indicate the definiteness of the word even when the Greek lacks the article. In English, we don't put "the" in front of God to show definiteness. We capitalize it. That's what Greek scholars recognize in this verse. While the Textus Receptus does incorporate both miniscules and majuscules, unlike the Codex Sinaiticus, it was written nearly 1 1/2 millennia after the original Greek New Testament was likely written, so it and similar manuscripts are entirely irrelevant to the issue at hand. With that being said, any exegetical analysis of John 1:1 in order to affirm or deny the deity of the Lord Jesus Christ should not be focused on the capitalization of the Greek text or subsequent English translation. In the first clause, ΕΝ ΑΡΧΗ ΗΝ Ο ΛΟΓΟϹ, the author appears to be alluding to Gen. 1:1 wherein the LXX translates the Hebrew בְּרֵאשִׁית (bĕrēʾšît) by the Greek ΕΝ ΑΡΧΗ. The interpretation of this clause is relatively straightforward, with the exception of the preposition ΠΡΟϹ (πρὸς). Ο ΛΟΓΟϹ, or “the word,” was ΠΡΟϹ ΤΟΝ ΘΕΟΝ. The majority of (if not all) commentaries agree that ΤΟΝ ΘΕΟΝ in John 1:1b refers to the eternal creator of the universe, Ο ΘΕΟϹ of Gen. 1:1. Finally, the clause in question. The author writes that Ο ΛΟΓΟϹ (“the word”) ΗΝ (“was”) ΘΕΟϹ. In the second clause, ΘΕΟϹ in the form of the definite, accusative ΤΟΝ ΘΕΟΝ referred to the Father (Yahveh, the creator of heaven and earth). But, Ο ΛΟΓΟϹ could not logically be identical with the Father because the second clause also stated that Ο ΛΟΓΟϹ was “with” the Father. To express a simpler analogy: if David was with Saul, then David cannot be the same person as Saul. Rather, the clause indicates that Ο ΛΟΓΟϹ and ΤΟΝ ΘΕΟΝ (1:1b) are two distinct persons. But, if ΘΕΟϹ does not refer to the Father, the creator of heaven and earth (cp. Gen. 1:1), then to what or whom does it refer? Undoubtedly, Yahveh, the creator of heaven and earth, Ο ΘΕΟϹ of Gen. 1:1, ΤΟΝ ΘΕΟΝ of John 1:1b, is ΘΕΟϹ κατὰ φύσιν. Being ΘΕΟϹ κατὰ φύσιν, Yahevh is eternal and uncreated, omnipotent and omniscient. All else is NOT ΘΕΟϹ κατὰ φύσιν, for all else is created and finite. Is Ο ΛΟΓΟϹ, ΘΕΟϹ κατὰ φύσιν or ΘΕΟϹ κατὰ καθήκον? The answer is determined by answering this simple question: is Ο ΛΟΓΟϹ created or uncreated? If Ο ΛΟΓΟϹ is created, then Ο ΛΟΓΟϹ is ΘΕΟϹ κατὰ καθήκον. However, if Ο ΛΟΓΟϹ is uncreated, then Ο ΛΟΓΟϹ is Yahveh and thus ΘΕΟϹ κατὰ φύσιν. 3 Everything was made by means of it,18 and not even one thing that was made was made without it. The author writes that “everything was made by means of” Ο ΛΟΓΟϹ, using the preposition δι᾽ (διά). Those who argue that Ο ΛΟΓΟϹ is created emphasize that everything was created “by means of” rather than “by” Ο ΛΟΓΟϹ. Not only is this argument unconvincing, it is inconsequential. Even if we suppose that everything was created “by means of” Ο ΛΟΓΟϹ as the instrumental cause,19 the author still states that everything was created by means of Ο ΛΟΓΟϹ. Logically, Ο ΛΟΓΟϹ could not have been used by the efficient cause (e.g., the Father) as the instrumental cause to create everything if it had not been created yet. In order for the efficient cause to have used Ο ΛΟΓΟϹ as the instrumental cause to create everything, Ο ΛΟΓΟϹ itself cannot be created, but rather, Ο ΛΟΓΟϹ must have already existed prior to creation. Of course, to exist prior to creation demands that Ο ΛΟΓΟϹ is uncreated, and if Ο ΛΟΓΟϹ is uncreated, then it must be ΘΕΟϹ κατὰ φύσιν. Because something not yet made (i.e., that does not yet exist) cannot be used to make itself. Perhaps 500 years prior to the conception of Christianity, Aristotle wrote many philosophical discourses concerning the nature of the things in the universe. In one such discourse, entitled “Categories” (Κατηγορίαι), he defines two types of οὐσίαι or “natures,” the former being “the primary natures” (αἱ πρῶται οὐσίαι), and the latter being “the secondary natures” (αἱ δεύτεραι οὐσίαι). Primary οὐσίαι, he wrote, are things such as “the certain (individual) man” (ὁ τὶς ἄνθρωπος) or “the certain (individual) horse” (ὁ τὶς ἵππος). Other examples would be “Peter,” “Paul,” “Yahveh,” and you the reader. On the other hand, secondary οὐσίαι categorically encompass the primary οὐσίαι. For example, Peter is a human (ἄνθρωπος), which loosely refers to his species (εἶδος), and he is also an animal (ζῷον), which loosely refers to his genus (γένος). The εἶδος and γένος, human (ἄνθρωπος) and animal (ζῷον), respectively, are secondary οὐσίαι. Aristotle, who was a pupil of this man (Plato), reduced philosophy into an art, and was very logical, hypothesizing that the fundamental elements of all things were “nature” (οὐσίαν) and “accident” (συμβεβηκός): one nature (οὐσίαν) underlying everything, but nine accidents (συμβεβηκότα): quantity, quality, relation, where, when, possession, posture, action, passion. Thus, nature (οὐσίαν) is such a thing as “god” (θεὸν), “human” (ἄνθρωπον), and each of the potentials falling under a similar denomination. Ἀριστοτέλης τούτου γενόμενος ἀκροατὴς εἰς τέχνην τὴν φιλοσοφίαν ἤγαγεν καὶ λογικώτερος ἐγένετο. τὰ μὲν στοιχεῖα τῶν πάντων ὑποθέμενος οὐσίαν καὶ συμβεβηκός. τὴν μὲν οὐσίαν μίαν τὴν πᾶσιν ὑποκειμένην, τὰ δὲ συμβεβηκότα ἐννέα. ποσὸν ποιὸν πρός τι ποῦ πότε ἔχειν κεῖσθαι ποιεῖν πάσχειν. τὴν μὴν οὖν οὐσίαν τοιαύτην εἶναι οἷον θεὸν ἄνθρωπον καὶ ἕκαστον τῶν τῷ ὁμοίῳ λόγῳ ὑποπεσεῖν δυναμένων. When we speak of something’s οὐσία, we are attempting to define “what it is.” You, let’s call you by the name “Joe,” are human, or ἄνθρωπος. ἄνθρωπος is your οὐσία (secondary οὐσία, according to Aristotle). But, as Yahveh is living, He, too, must have an οὐσία. What is Yahveh? The οὐσία of Yahveh is θεός (i.e., Yahveh is θεός). Peter (a name identifying “who?”) is human (a nature identifying “what?”). Yahveh (a name identifying “who?”) is god (a nature identifying “what?”). Ὅτι μὲν οὖν ἕτερόν ἐστιν οὐσία καὶ ἕτερον ὑπόστασις, πλειστάκις εἰρήκαμεν, καὶ ὅτι ἡ μὲν οὐσία τὸ κοινὸν καὶ περιεκτικὸν εἶδος τῶν ὁμοειδῶν ὑποστάσεων σημαίνει οἷον θεός, ἄνθρωπος, ἡ δὲ ὑπόστασις ἄτομον δηλοῖ ἤτοι πατέρα, υἱόν, πνεῦμα ἅγιον, Πέτρον, Παῦλον. Ἰστέον τοίνυν, ὅτι τὸ μὲν τῆς θεότητος καὶ τῆς ἀνθρωπότητος ὄνομα τῶν οὐσιῶν ἤτοι φύσεών ἐστι παραστατικόν, τὸ δὲ θεὸς καὶ ἄνθρωπος καὶ ἐπὶ τῆς φύσεως τάττεται, ὁπόταν λέγωμεν· Θεός ἐστιν ἀκατάληπτος οὐσία, καὶ ὅτι εἷς ἐστι θεός· λαμβάνεται δὲ καὶ ἐπὶ τῶν ὑποστάσεων ὡς τοῦ μερικωτέρου δεχομένου τὸ τοῦ καθολικωτέρου ὄνομα, ὡς ὅταν φησὶν ἡ γραφή· «Διὰ τοῦτο ἔχρισέ σε ὁ θεὸς ὁ θεός σου» (ἰδοὺ γὰρ τὸν πατέρα καὶ τὸν υἱὸν ἐδήλωσε), καὶ ὡς ὅταν λέγῃ· «Ἄνθρωπός τις ἦν ἐν χώρᾳ τῇ Αὐσίτιδι» (τὸν γὰρ Ἰὼβ μόνον ἐδήλωσεν). As John of Damascus noted, the name of a nature may be applied in reference to a an individual, i.e. a primary οὐσία. Here, ἄνθρωπος refers to species, or secondary οὐσία. Peter is the human (ὁ ἄνθρωπος). Here, ἄνθρωπος is used to refer to a particular individual of the species ἄνθρωπος (i.e., ὁ τὶς ἄνθρωπος); the individual is also known as a ὑπόστασις (hypostasis). If you recall, earlier we said that ὁ τὶς ἄνθρωπος referred to a primary οὐσία; thus, a ὑπόστασις is also equivalent to οὐσία in the sense of primary οὐσία, not secondary οὐσία. 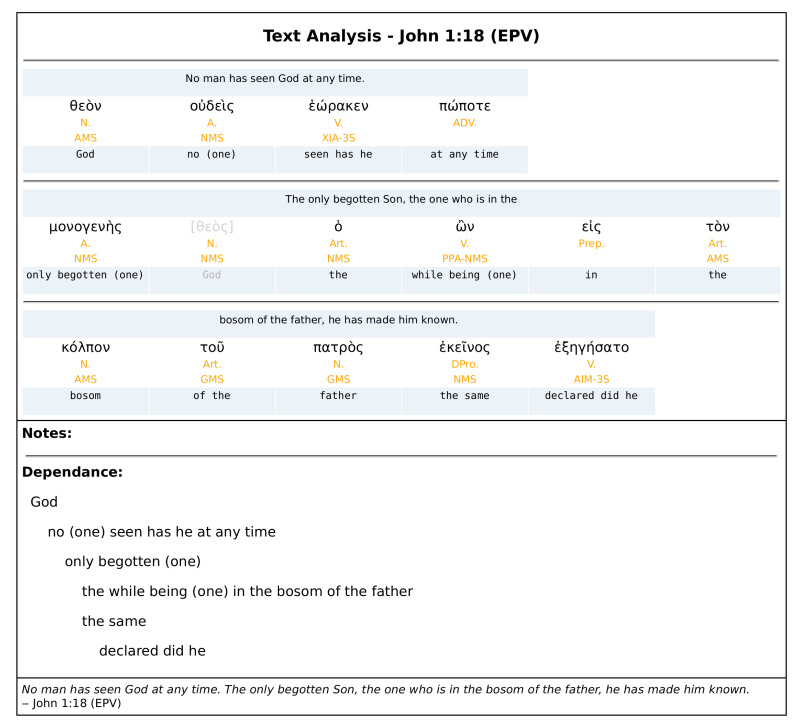 In John 1:1b, ΤΟΝ ΘΕΟΝ identifies a particular individual who is ΘΕΟϹ in nature; this person or ὑπόστασις is Yahveh (the Father). The definite article indicates a reference to an individual or ὑπόστασις. 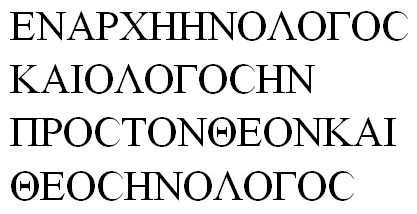 On the other hand, ΘΕΟϹ in John 1:1c identifies the secondary οὐσία (nature) of Ο ΛΟΓΟϹ. ΘΕΟϹ tells us what Ο ΛΟΓΟϹ is. Since we established that Ο ΛΟΓΟϹ is ΘΕΟϹ κατὰ φύσιν, and only Yahveh is ΘΕΟϹ κατὰ φύσιν, then Ο ΛΟΓΟϹ must also be Yahveh, like the Father (ΤΟΝ ΘΕΟΝ in 1:1b). What the Father is, the Son is. Both are god in nature. The capitalization of “god” is irrelevant. The fact that both are god in nature, rather than office, indicates that both are the eternal creators of the universe. 11 There is some debate whether ὁ θεὸς τοῦ αἰῶνος τούτου refers to Yahveh or Satan. My interpretation is that it refers to Satan as the instrumental agent of the blinding, while elsewhere Yahveh is identified as the ultimate agent of the blinding (Isa. 6:10 cp. John 12:40). Also cp. 2 Sam. 24:1; 1 Chr. 21:1. 16 Whether Isa. 14:13-14 and Eze. 28:2 refer to Satan even by allusion is inconsequential. More importantly, they demonstrate that anyone who attempts to usurp Yahveh’s authority is a “god” in their own mind. 17 There is no necessity to write majusculars as the Greek word θεὸς does not occur in this verse and there is no possibility of confounding the topic of discussion. 18 At this point in the prologue, I would prefer to translate the pronoun as “it” because anyone reading this passage for the very first time (also, 2000 years ago) would not have assumed by v. 3 that Ο ΛΟΓΟϹ is actually the pre-incarnate Lord Jesus Christ. This is methodically and intentionally introduced shortly thereafter by the author. 20 πρόσωπον, and in later philosophical and theological discussions, ὑπόστασις. Hippolytus. Origenis Philosophumena sive Omnium Hæresium Refutatio. Ed. Miller, Emmanuel. Oxonii: E Typographeo Academico, 1851. Jobes, Karen H. Exegetical Commentary on the New Testament: 1, 2, & 3 John. Ed. Arnold, Clinton E. Grand Rapids: Zondervan, 2014. John of Damascus (Ἰωάννης ὁ Δαμασκηνός). “An Accurate Exposition of the Orthodox Faith” (Ἔκδοσις Ἀκριβὴς τῆς Ὀρθοδόξου Πίστεως). Patrologiæ Cursus Completus: Series Græca Prior. Ed. Migne, Jacques Paul. Vol. 94. Petit-Montrouge: Imprimerie Catholique, 1857. This answer is supplementary to Frank Luke's, and supports it. When someone makes a claim about an ancient language's grammar, it always helps me to believe it and internalize it when I can see parallel usages that illustrate the truth of the claim. Thus, I am glad that Frank Luke offered several examples. For those of you who don't know Greek, "the man" and "the Sabbath" are in the genitive, which is often rendered by adding an "of" in English. Now the one confusing thing about this verse is that the τοῦ σαββάτου goes with κύριός and not υἱὸς (to claim otherwise would turn the sentence into mumbo-jumbo, especially in context). Therefore, what is happening is that "Lord" has been moved forward in the sentence for emphasis, but the article has been placed only on "son" because that is the subject of the sentence. Thus, something to the effect of: "Therefore, the Son of Man is Lord, even of the Sabbath!" To claim that the Son of Man is "a lord" of the Sabbath would be very odd, obscure the meaning of the wider passage, and raise other strange questions (who are the other lords? etc.). Notice the grammar of this sentence, though, slightly simpler than the above verse, is fundamentally that same: it is a predicative nominative construction (both major nouns in the sentence are in the nominative case and are joined by the standard copulative verb). In English the article ("the") is used to make a word definite. The meaning of the Greek article is slightly different, which can make it difficult for English speakers to grasp. "The primary function of the [Greek] article is not to make a word definite. When the article is not present, it is generally emphasizing the quality of the substantive." You would not translate that verse "God is a love" because that is not what the Greek is saying. Likewise, John 1:1 is not saying "the Word was a god," but is rather saying something somewhat like, "the Word was God in essence*"... which is weird English, so we translate it "the word was God" and that conveys the meaning well for English readers. I am sure that this is not the answer that most people want to hear. From a purely grammatical perspective, before claiming that Jehovah’s Witnesses added “a God”, see why many Trinitarian Bible translations have translated John 1:1 as “a God”. The NWT was published in 1951 and I am quoting from the appendix of the New World Translation for their decision. Similar rendering can be found in nearly 60 different translations. I can’t explain it better. — The New Testament, in An Improved Version, Upon the Basis of Archbishop Newcome’s New Translation: With a Corrected Text, London. — The Emphatic Diaglott (J21, interlinear reading), by Benjamin Wilson, New York and London. — The Bible—An American Translation, by J. M. P. Smith and E. J. Goodspeed, Chicago. — Das Evangelium nach Johannes, by Siegfried Schulz, Göttingen, Germany. — Das Evangelium nach Johannes, by Johannes Schneider, Berlin. — Das Evangelium nach Johannes, by Jürgen Becker, Würzburg, Germany. These translations use such words as “a god,” “divine” or “godlike” because the Greek word θεός (the·os′) is a singular predicate noun occurring before the verb and is not preceded by the definite article. This is an anarthrous the·os′. The God with whom the Word, or Logos, was originally is designated here by the Greek expression ὁ θεός, that is, the·os′ preceded by the definite article ho. This is an articular the·os′. Careful translators recognize that the articular construction of the noun points to an identity, a personality, whereas a singular anarthrous predicate noun preceding the verb points to a quality about someone. Therefore, John’s statement that the Word or Logos was “a god” or “divine” or “godlike” does not mean that he was the God with whom he was. It merely expresses a certain quality about the Word, or Logos, but it does not identify him as one and the same as God himself. In the Greek text there are many cases of a singular anarthrous predicate noun preceding the verb, such as in Mr 6:49; 11:32; Joh 4:19; 6:70; 8:44; 9:17; 10:1, 13, 33; 12:6. In these places translators insert the indefinite article “a” before the predicate noun in order to bring out the quality or characteristic of the subject. 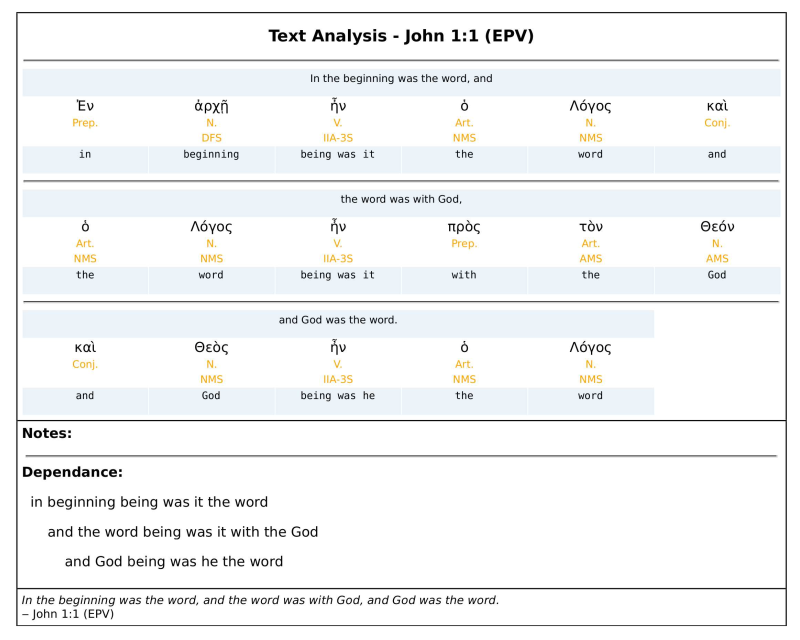 Since the indefinite article is inserted before the predicate noun in such texts, with equal justification the indefinite article “a” is inserted before the anarthrous θεός in the predicate of John 1:1 to make it read “a god.” The Sacred Scriptures confirm the correctness of this rendering. Following is a list of instances in the gospels of Mark and John where various translators have rendered singular anarthrous predicate nouns occurring before the verb with an indefinite article to denote the indefinite and qualitative status of the subject nouns. However, the NWT Translation Committee chose to use the indefinite article “a” (“divine” in footnote) to so render as it did and not like Moffatt and Goodspeed, because of two factors. One, its avowed principle of being as “literal as possible” and second, the context, as the Greek shows a contrast between two that are “theos” but only one is “ho theos”, “the God”. For more scholars who endorse John 1:1 as “a God” or “divine” see the article JOHN 1:1c: “God,” “divine” or “a god”? Another interesting fact is that one of the earliest languages into which the Greek New Testament was translated was Coptic in the 3rd Century, prior to the adoption of Trinity by Egyptian churches. Coptic has the definite article, and existing 3rd/4th century manuscript read “a God”! Trinitarians try to use a weak defense, saying that the Coptic text could also be translated into English as “God”. See more details in the article Coptic John 1:1c: What Conclusions Can Be Drawn? One user has answered that John 1:3 would contradict with 1:1 if the translation is “a God”. Again, the translation submitted by him is the problem. Many translations, including NWT, translate it as “through him” not “by him”. For example, the NIV translates it as, “Through him all things were made; without him nothing was made that has been made.” That is why Jehovah’s Witnesses teach that Jesus is “a God”, or a powerful person with Godlike qualities, a mighty God himself, but not Almighty God Jehovah. Note that the Bible uses the word “God” for Satan and for human beings, denoting a powerful person. These are in harmony with Colossians 1:15, where it states that Jesus is the “firstborn of all creations” and all other things were made “through him and for him”. And finally there are other scriptures which are translated as "a God" though the context may be different. See below. The translation of 'THEOS' as 'a god' is not a good choice. On the other side, however, the widely accepted decision not to make any distinction between articulated 'HO THEOS' and unarticulated 'THEOS' apparent in this context is not very good either because it seems not to represent the gospel writer's intention adequately. The Word, HO LOGOS, has everything that belongs to God. He shares the very essence of the One with whom all originates. The Word was with the God, in the beginning. HO LOGOS ÊN PROS TON THEON. In English or German it cannot be said as in the Greek. To translate God was the Word is not what John intended to say. Otherwise he would have said it thus. HO THEOS ÊN HO LOGOS would have been perfectly possible to say if that was what he wanted to say. To translate 'A god was the word' is a foolish attack. Quite senseless and contradictory. No reason to boast. Any translation must fall short in this case. Maybe this is what we should come to appreciate. Question Restatement: Does John 1:1 refer to Jesus, the Word, as "The Most High", or simply god, in form and nature, being the Son of God? Significance of the Question: Whether it is a doctrinal condition for salvation that one must believe that "Jesus is the Most High, the Father", is WAY out of the scope of -John 1. So, any claim that this text asserts some condition for salvation- at the very least - is an incredible distortion of that passage. John 1:1 uses specific terms which indicate that the "Gospel of John" was written to people familiar with both Greek Philosophy, and the creation narrative in Genesis. The context clearly is about "The Word | ὁ λόγος", a Greek / Indian / Persian and Egyptian philosophical reference to "divine reasoning". (See logos @ brittanica.com .) This is not really seen in Hebrew Scripture, though perhaps as "the Wisdom of God" personified in the books of Song of Songs, and Proverbs. John 1 - The Logos was in the beginning, and divine, and [stood] before The Most High. ... And then, the Logos became flesh and dwelt among us. Notes: 1.) The incredible significance would have been grasped immediately - by a Greek audience. 2.) The prepositional phrase "πρὸς τὸν θεόν" does not mean "with God". Rather, it denotes "being in front of", or metaphorically, a place of compliance, being in accordance to, standing before [a king]. In English, "before" can imply a sense of time - which is not being conveyed here, in the Greek. 2 Cor. 4:3-4, NASB - 3 But even if our gospel is veiled, it is veiled to those who are perishing, 4 whose minds the god of this age has blinded, who do not believe, lest the light of the gospel of the glory of Christ, who is the image of God, should shine on them. NASB, John 3:6 - That which is born of the flesh is flesh, and that which is born of the Spirit is spirit. NASB, 1 Corinthians 1:24 - but to those who are the called, both Jews and Greeks, Christ the power of God and the wisdom of God. Note on Consubstantiality: "One Substance" is actually, "Same Substance", (homo-ousian). The term is also used to describe the common humanity which is shared by all human persons. Thus, Jesus Christ is said to be consubstantial with the Father in his divinity and consubstantial with us in his humanity, (from Consubstantiality, Wikipedia). Colwell's reasoning is often misapplied to justify omitting the indefinite article, "a god" - which would indicate a "divine nature or essence". See also, the related question, which discusses "subset" and "convertible" propositions, which can alternatively be applied, rather than Colwell's Rule. Fourth, Colwell seems to have misunderstood what a definite semantic to the noun entailed linguistically. His improper method of prescription, based on his analysis, led him to commit a category mistake by foisting a semantic upon a certain group of nouns (pre-copulative PNs) that he failed to appreciate on their own terms. Because of this, and apparently without considering the ramifications of what the semantic suggested, he applied it to John 1:1c and argued against the indefinite or qualitative sense. But this was an improper use of his own rule, for his rule was only to be applied post hoc to nouns clearly understood to be definite from context. At issue is whether Colwell's rule applies to John 1:1 and if it is a reliable standard by which grammatical constructions of this type should be measured. It has been pointed out that Colwell's rule does not help by determining definiteness. Rodney J. Decker stated, "it has often been misused by well-intentioned defenders of the deity of Christ." Daniel B. Wallace argues that the use of the anarthrous theos (the lack of the definite article before the second theos) is due to its use as a qualitative noun, describing the nature or essence of the Word, not due to Colwell's rule. See also Wikipedia, John 1:1. Clear Translation Biases - Robbery, or Not Robbery? John 10:36, NASB - do you say of Him, whom the Father sanctified and sent into the world, 'You are blaspheming,' because I said, 'I am the Son of God '? I am surprised that only two people mentioned Colwell's rule in relation to this passage. Colwell's rule applies to about 80% of the cases where an articleless predicate noun and an articled noun appear. That is really good for a Greek rule. There are major textual clues which support using Colwell's rule here. First, the passage is chiasmic with the clause before. Second, to switch from talking about the God in the two previous clauses, then to a god, and back to the God seems disjointed to say the least. Most Greek rules are merely strong guidelines, except for Sharp's rule but it is so rarely applicable that it stands as the exception. Greek is notorious for not using articles and for using them in places we never would. This is why literal translation is not best. If we take John's Gospel as a whole, then translating 1:1 as a God would be in contradiction with 14:6, 10:30 and others. Good Hermeneutics is about digging deeper based on holistic knowledge (in this case the large Gospel of John). To argue that a lack of article means an indefinite God, one would have to translate many passages of the NT as a god and would drastically alter the natural context of simple and uncontested verses. For instance, there is no article in front of the word God in the first 4 verses of Romans, is that all to be read "a god?" No. So, long and short, Colwell's rule applies (as well as it can) and the context combine with literary indicators and larger intent of John's Gospel all point to "God" and not "a god" as the appropriate translation. Take note of the last phrase. What is the justification for flipping the order of the nouns, which is what must be done to get, "and the word was God"? The KJV has "my father" here, but there is no genitive case. Perhaps the appeal to John's logic is insufficient evidence, so it might prove profitable to investigate a couple of other instances of θεός where the definite article is missing. Furthermore, he is not the God of the dead, but of the living. For, all to him are alive. There is an implied reiteration of the subject in the second part of the statement, since whatever he is not for the dead, he is for the living (bracketed). The first possibility can be eliminated pretty-easily, since it really isn't likely that Jesus, or the writer recording his words, would imply there was more than ONE God of the living, which is what one gets from "he is [a God] of the living". Now, the only reason for choosing the third possibility, would be a stubborn reluctance to include the definite article, since there can be no doubt the writer of Luke's Gospel believed/knew, as did Jesus, that there is but ONE God of the living. No one has ever seen God, but the one and only Son, who is himself God and1 is in closest relationship with the Father, has made him known. ESV: What does "the only God, who is at the Father's side" mean? No one has ever seen God; the only God,2 who is at the Father’s side,3 he has made him known. NASB: Who is the "only begotten God"? No man has seen God at any time. The only begotten Son, the one who is in the bosom of the father, he has made him known. The second instance of Θεὸς that appears in WH Greek but not TR, has been ignored, since attempts to accommodate it (see NIV, ESV, NASB above) introduce ideas that are not only foreign to the Gospel of John, but foreign to the entire NT. It clearly has no logical place in the author's argument. Regardless of all the issues the additional Θεὸς has caused for translators, the Θεὸς that remains, having no definite article, could not possibly be translated as "a God". If the Gospel writer has used Θεὸς without the definite article in John 1:18, and no one is in any doubt that he is referring to "the" Θεὸς, then its appearance as such in John 1:1 shouldn't be an issue, either. It might be God to look at what other texts say to show if it should read "a god" or God." “My God” who is He? Jesus must have been calling to the Almighty, the Father, his God, see John 20:17, “my God”, (Lit. Gk. "God of me" 'The NASB-NIV parallel N.T. in Gk. & Eng.' with Interliner Translated by Alfred Marshall) quoting from Ps 22:1 where King David was, showing that God is somone other than himself. No, Jesus cannot be Almighty God if he plainly says in the above texts that he himself has a “God”! JOHN 1:1-2 Literal translation from Greek in beginning was the word and the word was toward the god and god was the word this (one) was in beginning toward the god A help. “The title ho theos [the God, or God], which now designates the Father as a personal reality, is not applied in the N[ew] T[estament] to Jesus Himself; Jesus is the Son of God (of ho theos). . . . Jn 1:1 should rigorously be translated ‘the word was with the God [=the Father], and the word was a divine being.’”—Dictionary of the Bible (1965), by John L. McKenzie, S.J. So if Jesus called out to "MY [HIS] GOD" then how can he be "God"? So therefore we can conclude that Jesus must be a divine or superhuman being; "a god" when in heaven as in John 1:1 and when on earth he called out to "Ho Theos" or "God" of John 1:1. (CEV) Christ is exactly like God, who cannot be seen. He is the first-born Son, superior to all creation. (GB) Who is the image of the invisible God, the first begotten of every creature. (GW) He is the image of the invisible God, the firstborn of all creation. (HNV) who is the image of the invisible God, the firstborn of all creation. (>LITV) who is the image of the invisible God, the First-born of all creation. (MKJV) who is the image of the invisible God, the First-born of all creation. (MRC) He is the image of the invisible God, the first-born of all creation. (WEB) who is the image of the invisible God, the firstborn of all creation. Strong’s No. 3956 πᾶς pas pas Including all the forms of declension; apparently a primary word; all, any, every, the whole: - all (manner of, means) alway (-s), any (one), X daily, + ever, every (one, way), as many as, + no (-thing), X throughly, whatsoever, whole, whosoever. So if Jesus was born of God and the first one to be so how can he be "God"? When 'the' is placed before Theos, I understand that to be definitive, therefore to be a matter of Divine Person, rather than Deity as a matter of nature. When it is absent, I would understand that Divine Nature, as such, is being emphasised. Thus "and Deity was the Logos" emphasises that Divine Nature was that which is a matter of Logos. And the addition of the definite article, "the Logos" then emphasises the individual spoken of. So the same phrase, "and Deity was the Logos" emphasises both Divine Nature and Divine Person. In other words, the utterances of God are different from human utterances in that they carry divine power and authority. IE: "Let there be light and there was light". However, that isn't the only grammatically viable option. The other is "a god". This has the advantage of accommodating that the logos was "with God" without upending millennia of Jewish monotheism. I'm currently torn between the two. To summarize Robertson's Grammar on this, predicate nominatives usually don't have the article, and this distinguishes the predicate from the subject, i.e. the Word was God, not God was the Word. The Word was a god violates Greek grammar. (i) NOUNS IN THE PREDICATE. These may have the article also. As already explained, the article is not essential to speech. It is, however, “invaluable as a means of gaining precision, e.g. θεὸς ἦν ὁ λόγος.” As a rule the predicate is without the article, even when the subject uses it. Cf. Mk. 9:50; Lu. 7:8. This is in strict accord with the ancient idiom. Gildersleeve (Syntax, p. 324) notes that the predicate is usually something new and therefore the article is not much used except in convertible propositions. Winer,4 indeed, denies that the subject may be known from the predicate by its having the article. But the rule holds wherever the subject has the article and the predicate does not. The subject is then definite and distributed, the predicate indefinite and undistributed. The word with the article is then the subject, whatever the order may be. So in Jo. 1:1, θεὸς ἦν ὁ λόγος, the subject is perfectly clear. Cf. ὁ λόγος σὰρξ ἐγένετο (Jo. 1:14). It is true also that ὁ θεὸς ἦν ὁ λόγος (convertible terms) would have been Sabellianism. See also ὁ θεὸς ἀγάπη ἐστίν (1 Jo. 4:16). “God” and “love” are not convertible terms any more than “God” and “Logos” or “Logos” and “flesh.” Cf. also οἱ θερισταὶ ἄγγελοί εἰσιν (Mt. 13:39), ὁ λόγος ὁ σὸς ἀλήθειά ἐστιν (Jo. 17:17), ὁ νόμος ἁμαρτία; (Ro. 7:7). The absence of the article here is on purpose and essential to the true idea. Cf. also ἀνθρωποκτόνος and ψεύστης (Jo. 8:44). In Eph. 5:23, ἀνήρ ἐστιν κεφαλή, the context makes it clear (W. H. marg. ἀνὴρ κεφαλή ἐστιν) that ἀνήρ is subject even without the article. In Jo. 9:34, ἐν ἁμαρτίαις σὺ ἐγεννήθης ὅλος, the article with ὅλος is not needed, a neat use of the predicate adjective. But the article is quite frequent with the predicate in the N. T. and in strict accord with old usage. It is not mere haphazard, however, as Winer rather implied. Hence W. F. Moulton, in his note to Winer, properly corrects this error. He finds that when the article is used in the predicate the article is due to a previous mention of the noun (as well known or prominent) or to the fact that subject and predicate are identical. The words that are identical are convertible as in the older idiom.4 If he had added what is in Winer-Schmiedel,5 that the article also occurs when it is the only one of its kind, he would have said all that is to be said on the subject. But even here Moulton’s rule of identity and convertibility apply. The overrefinement of Winer-Schmiedel’s many subdivisions here is hardly commendable. In a word, then, when the article occurs with subject (or the subject is a personal pronoun or proper name) and predicate, both are definite, treated as identical, one and the same, and interchangeable. The usage applies to substantives, adjectives and participles indifferently. Cf. ὁ λύχνος τοῦ σώματός ἐστιν ὁ ὀφθαλμός (Mt. 6:22), ὑμεῖς ἐστὲ τὸ ἄλας τῆς γῆς (Mt. 5:13), ὁ δὲ ἀγρός ἐστιν ὁ κόσμος (13:38), σὺ εἶ ὁ Χριστός (16:16), εἶς ἐστιν ὁ ἀγαθός (19:17), τίς ἄρα ἐστὶν ὁ πιστὸς δοῦλος (24:45), τοῦτό ἐστιν τὸ σῶμά μου, τοῦτό ἐστιν τὸ αἷμά μου (26:26, 28), σὺ εἶ ὁ βασιλεύς (27:11), σὺ εἶ ὁ υἱός μου (Mk. 1:11), οὐχ οὗτός ἐστιν ὁ τέκτων (6:3), οὗτός ἐστιν ὁ κληρονόμος (12:7), οὐ γάρ ἐστε ὑμεῖς οἱ λαλοῦντες (13:11), ἡ ζωὴ ἦν τὸ φῶς (Jo. 1:4), ὁ προφήτης εἶ σύ (1:21), σὺ εἶ ὁ διδάσκαλος (3:10), οὗτός ἐστιν ὁ προφήτης (6:14), οὗτός ἐστιν ὁ ἄρτος (6:50; cf. 51), τὸ πνεῦμά ἐστιν τὸ ζωοποιοῶν (6:63), ἐγώ εἰμι τὸ φῶς (8:12), οὐχ οὗτός ἐστιν ὁ καθήμενος (9:8; cf. 19 f.), ἐγώ εἰμι ἡ θύρα (10:7), ἐγώ εἰμι ὁ ποιμήν (10:11), ἐγώ εἰμι ἡ άνάστασις καὶ ἡ ζωή (11:25, note both articles), ἐγώ εἰμι ἡ ὁδὸς καὶ ἡ ἀλήθεια καὶ ἡ ζωή (14:6, note three separate articles), ἐκεῖνός ἐστιν ὁ ἀγαπῶν μς (14:21), οὗτός ἐστιν ὁ λίθος (Ac. 4:11), οὗτός ἐστιν ἡ δύναμις (8:10), οὐχ οὗτός ἐστιν ὁ πορθήσας (9:21), οὗτός ἐστιν ὁ ἄνθρωπος (21:28), οὐκ ἄρα σὺ εἶ ὁ Λἰγύπτιος (21:38), ἡ κεφαλὴ ὸ Χριστός ἐστιν (1 Cor. 11:3), ὁ δὲ κύριος τὸ πνεῦμά ε͂στιν (2 Cor. 3:17), αὐτός ἐστιν ἡ εἰρήνη ἡμῶν (Eph. 2:14), ἡμεῖς ἡ περιτομή (Ph. 3:3), ἡμεῖς γάρ ἐσμεν ἡ περιτομή (3:3), ἡ ἁμαρτία ἐστὶν ἡ ἀνομία (1 Jo. 3:4), ἐγώ εἰμι τὸ Ἅλφα καὶ τὸ Ὦ (Rev. 1:8), ἐγώ εἰμι ὁ πρῶτος καὶ ὁ ἔσχατος (1:17, note both articles), σὺ εἶ ὁ ταλαίπωρος (3:17), etc. This list is not exhaustive, but it is sufficient to illustrate the points involved. Note ὁ βασιλεύς (Mt. 27:11) and βασιλεύς (Jo. 1:49). Even the superlative adjective may have the article as in Rev. 1:17 above. But see οἱ ἔσχατοι πρῶτοι καὶ οἱ πρῶτοι ἔσχατοι (Mt. 20:16) for the usual construction. Cf. ἐσχάτη ὥρα (1 Jo. 2:18). See further ἐν ἐσχάταις ἡμέραις, Jas. 5:3; 2 Tim. 3:1; ἐν καιρῷ ἐσχάτῳ, 1 Pet. 1:5, and τῇ ἐσχάτῃ ἡμέρᾳ, Jo. 6:39. For the common predicate accusative see chapter XI (Cases), VII, (i). In the N. T. most examples are anarthrous (Jo. 5:11; 15:15), and note 1 Cor. 4:9 ἡμᾶς τοὺς ἀποστόλους ἐσχάτους ἀπέδειξεν. Cf. Gildersleeve, Syntax, p. 326. Robertson, A. T. (2006). A Grammar of the Greek New Testament in the Light of Historical Research (pp. 767–769). Logos Bible Software. I could cut and paste them here but that would be quite a lot of text, better to go and have a look for yourselves. Therein some do follow the 'traditional' rendering but many follow the NWT. How can Jesus be God & High Priest of God & an Apostle & a Medatior, between man and God & be God? Hebrews 3:1 "Consequently, holy brothers, partakers of the heavenly calling, consider the apostle and high priest whom we acknowledge—Jesus." 1 Timothy 2:5 "For there is one God, and one mediator BETWEEN God and men, a man, Christ Jesus,"
All services rendered to God my a lesser person than God! Example; God cannot be a "High Priest" as a "High Priest" serves God and man! Acts 2:24 "But God resurrected him [Jesus' see vs.""] by releasing him from the pangs of death, . . ."
So if Jesus thinks of his "Father" as "my "God" how can Jesus be Almighty God Also?? The definite article is left off to highlight a difference. Many times the definite article is left off of the predicate of a sentence. Jesus is a god. Apart from god Jesus created all things. He is image of god -- he looks like him but He was created. Almighty god was the creator Jehovah. The Greek word for "God" is "Θεός" and has survived in English in words like "Theology", "Theism" etc. "Θεόν" in the text above is third person inflection. Not the answer you're looking for? Browse other questions tagged john greek new-world-translation or ask your own question. What is the original Greek translation of John 1:1? Why is the Greek word Θεὸς in John 1:1c treated as a proper noun in English Translation? Is Jesus false god in John 1:1? John 1:1 Which is correct in the translating of the wording θεὸς ἦν, was God, or was a god? What arguments exist that would refute the theory concerning Aramaic primacy of the New Testament? What does “My Lord and my God” Mean? Is NWT's translation of John 8:58 reasonable? In Hebrews 1:2, to what does the Greek word «αἰῶνας» refer?